The Psychic Tarot for the Heart oracle deck by renowned American psychic medium and author John Holland is keenly accurate. I recommend having it on hand, whether you know nothing about tarot and oracle cards or you’re a pro. It’s great for pulling cards when a sub-issue raised during a tarot reading might need supplemental information, which is how I use it. If you’re not that into tarot, then this is a really great deck to have, because you simply ask a question, pull a card, and the keyword you get pretty much answers that question and in this deck, a picture truly does tell a thousand words. The end. You don’t have to learn any traditions or take this deck to bed and study each card symbol by symbol. I can’t put my finger on why exactly this deck works so well, but it does. However, I’m not so sure it’s suitable for professional readers as the exclusive tool. If you’re programmed to read tarot and love tarot and eat, sleep, and breathe tarot, then I would surmise that the Psychic Tarot for the Heart oracle deck won’t be right for you. That said, I highly recommend this deck for gift-giving, especially to those who are not full-force into tarot but are looking for a go-to oracle deck that will answer questions succinctly and be really spot on in its assessment of a given situation. On a mass consumption level, it’s actually a fantastic oracle deck for asking quick questions and getting quick answers. The messages and affirmations in the accompanying Guidebook are empowering and I really mean it– it’s an extraordinary oracle deck [for someone not that into tarot] to consult everyday. Tarot folk can get very set in our ways, which isn’t a good thing, but because of how set we can be, sometimes getting such a person to try out an oracle deck like this one may be a hard sell. If, however, you’re someone who loves oracle decks already, then without reservation I’m telling you you’re going to like this deck. The cards are large, 3.5″ x 5.0″ in dimension, laminated, and glossy. Consumer reviews on Amazon suggest that the card quality is below par, but I wasn’t sure what they were referring to. Mine was just fine. What were these people expecting? This is a mass market oracle deck, and as such, the quality of it is actually quite great. As for the structure, it’s a 65-card deck, not 78 as it would be in traditional tarot, so the use of “Tarot” in the deck title doesn’t make a lot of sense to me. I guess like tarot, there are 22 cards that correspond with the Major Arcana, and the keywords are generalized echoes of the traditional card attributions in the Majors. Example, Key 3 is Nurture, comparable to The Empress, Key 14 is Balance, comparable to Temperance, etc. The imagery in the deck is evocative of emotions and that’s really the strength of this deck–triggering particular intuitive–or psychic–responses from you. The card Confront, for example, which corresponds with Key 18: The Moon, features incredibly evocative imagery. All the card images relate to the keywords insightfully well, and while that sounds like it should be a given (for those who are into tarot art), it’s not really a given in the commercial oracle deck world (I won’t name names). I do love that the artwork is multicultural and I very much thank Holland for that sensitivity. The deck is truly holistic and incorporates many traditions, many heritages, and I believe fully articulates where we are spiritually as a society today. It’s an incredible testament to the modern spiritual movement, for sure. The chakra cards in the Psychic Tarot for the Heart, in lieu of the Tarot Courts. Like traditional tarot structure, the Minors are subdivided into four suits, which generally correspond with Wands, Cups, Swords, and Pentacles and the messages in the cards relate to the traditional four planes that the suits correspond with. Each suit is indicated by a different colored border. The color choices tripped me up a bit. Wands, which I associate with Fire, in the Psychic Tarot for the Heart has a purple border. Cups is green, which can work, because of that whole heart chakra thing. Swords is indigo and Pentacles is red. Interestingly enough, red for Earth energy makes sense from an Eastern metaphysical perspective. Each suit is numbered only 1 to 9, which again resonates with Eastern numerology. There are no court cards. 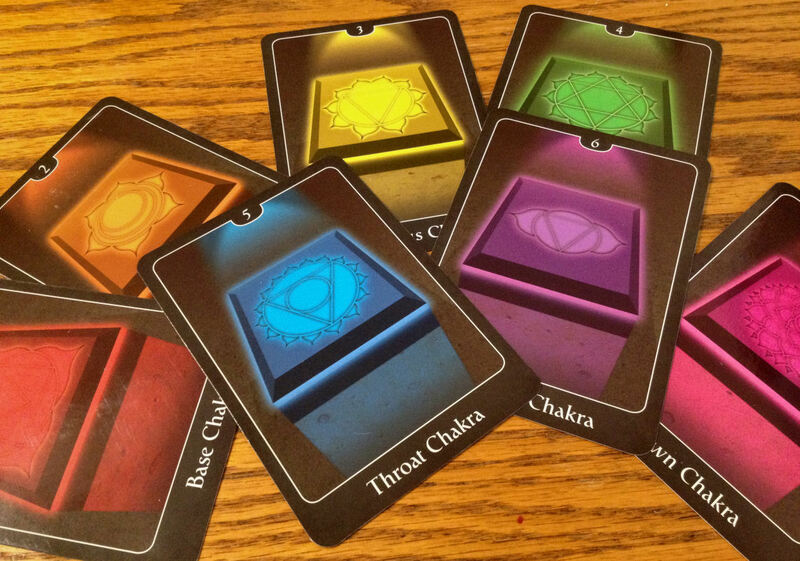 In lieu of the courts, you have an additional 7 chakra cards. I love the chakra cards. I love using them to activate or energize certain chakras for particularized energetic work. None of the card imagery jars the sensitive consciousness. They’re all soft, inviting, and the “darker” cards can be represented by what you see above, the correspondent to either the 9 of Swords or 10 of Swords (I say 10 of Swords only because there is no 10 in the Psychic Tarot for the Heart deck, whereas the meaning of this card 9: Darkest Fears would in theory cross over to either the traditional 9 or 10). Some of the card meanings in the Psychic Tarot for the Heart are loose interpretations of their traditional tarot counterparts. Take Key 6: The Lovers card, for instance. By most traditional accounts of Key 6, The Lovers card isn’t about romantic love per se, but rather it’s about moral choice. It expresses the duality of the Tree of Life and the Tree of Knowledge and how that duality might manifest in our lives. 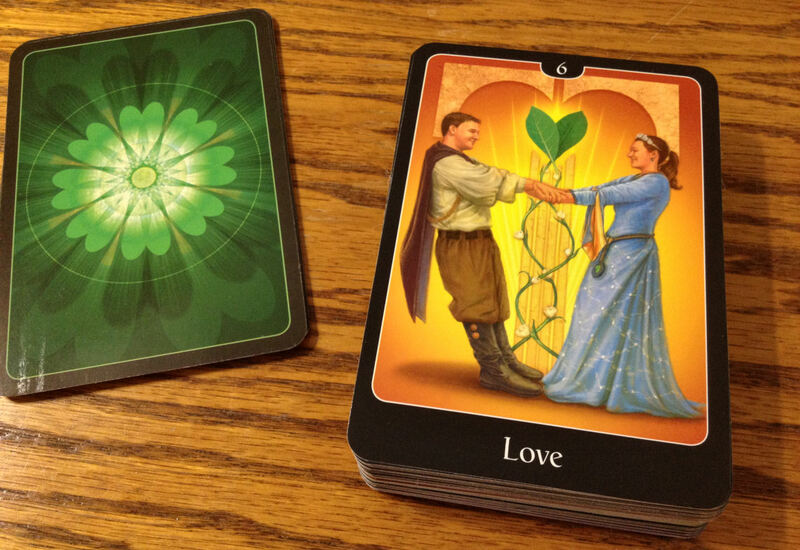 Here in Psychic Tarot, Key 6: Love seems to suggest budding romance. One of the criticisms I read about the deck is that it’s called “for the Heart” but then it isn’t exclusively about love and romance. Um… sorry, what a silly point of criticism. To me, this deck is about expressing the heart chakra (in case it wasn’t overtly obvious from the card backs), which relates to compassion, love per all its meanings, not just romantic love, emotional healing, and being able to sort through your emotions in a way that will better empower you to make everyday life decisions. So the “for the Heart” part of the deck name didn’t bother me; it was the “Tarot” part that got me scratching my head. So now I get to why I say this oracle deck is eerily accurate. I had just acquired the deck. When I first unwrapped the deck, before I shuffled it, I turned to a random card and it was Coming Together, corresponding with the Two of Cups. After shuffling the deck, I drew another card at random and again it was Coming Together. I found the repeat appearance of the card kind of strange. Later that same day I drew another card and again, for the third time in the same day, on the first day I got this deck, I got Coming Together. I pay attention to synchronicities. Another story: I was in a state where I really had to go pee. Really badly. But oddball me, in this agitated state, decided to shuffle the deck and draw a card. Are you kidding me? That’s hilarious. Later (after the release), Hubby played the game, too. He asked a question related to his work and drew a card. “Well, that’s vague,” he said, not satisfied. I urged him to ask for clarification, so he did, tongue in cheek, because tarot and oracle deck divination really aren’t his thing. In fact generally spirituality isn’t his thing. Hubby then pulled a card. I hadn’t realized he was asking a question. In the card image you see a figure with his back turned to the onlooker, walking away, footprints in the sand, and ocean waves lapping nearby. “I don’t think your tarot deck likes me,” he says. Oracle deck. It’s an oracle deck. “Why don’t you like me, Mr. Tarot?” Hubby asks. He draws a final card. I stifle my chuckles. At this point Hubby hands the deck back to me. He’s not smiling anymore. “I don’t know. That’s just creepy.” He walks away. Like Hubby, I experience an eerie accuracy with the Psychic Tarot of the Heart. As a tarot deck, I’m not a fan. As an oracle deck, this is awesome. I see great value to having this deck as a supplement to a tarot reading. I see even more value in the deck to one who may not be that into tarot or oracle cards but would like an easy-to-use intuitive tool. I know I am shortchanging the deck for saying this– but you don’t really need to learn or study anything to use this deck. You can draw a card, read the keyword, look at the picture, and you’re there. I will conclude this review with a reading for you, from the Psychic Tarot of the Heart oracle. Opportunity Beckons, corresponding with the Four of Cups. And I agree, I tend to prefer more classic artwork as well. Benebell, thanks for the great review. I always see this deck at our local Barnes & Nobles but while it does peak my curiosity I always left the store empty handed (mostly because I really don’t *need* another oracle deck taking valuable retail space. lol). Great review Benebell! I bought this a few months ago and I really like it. The artwork is wonderful and I appreciate the attempt at diversity. But I’m really drawn to the words and phrases used on the cards. I have been using the deck to create spreads much like one would do with the Deck of 1000 Spreads. 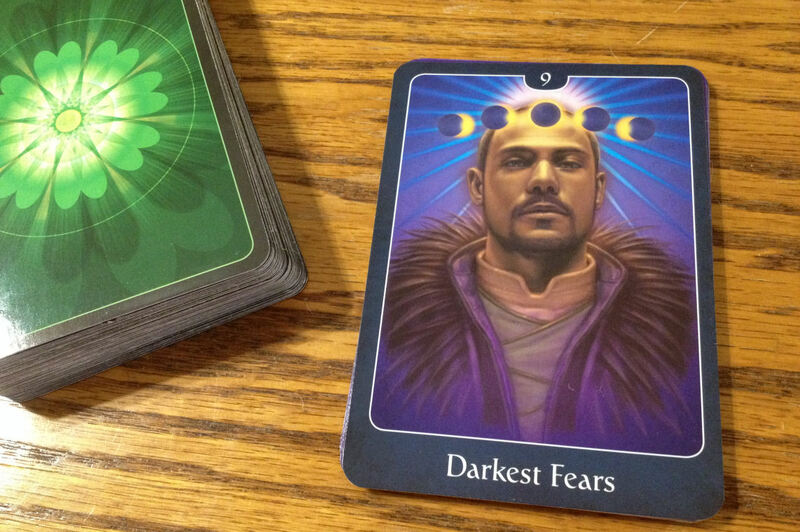 For example, I created a shadow work spread with the cards: Darkest Fears, Refusing To See, Confront, Release. 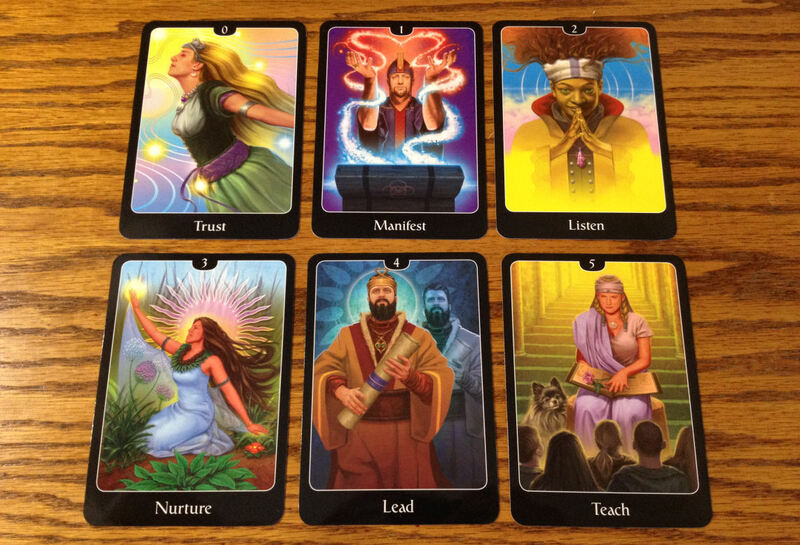 I use these cards as focusing tool and then select cards from one of my other decks to place over these for insight. Very powerful! I look forward to your thoughts on this too…. Thank you for such a factual review…. Reblogged this on Meandrous Kuudere. one else realize such particular approximately my problem.